In 2015, refugees and migrants fled from various parts of the world including Syria, Afghanistan and Iraq to seek asylum in the EU. Titled ‘The Migrant Crisis’, this sad state of affairs dominated the headlines and continues to do so as 1000s of innocents lost their lives in the hopes of escaping hardship and began to open a younger generation’s eyes in the West as to the various atrocities taking place world wide. Brought to light in Tess Berry-Hart‘s Cargo, migration begins to unravel its complex nature. 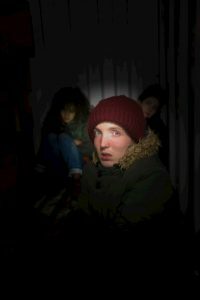 Contained in Max Dorey‘s brilliant yet unforgiving set, Cargo reminds the audience that the slightest of movements on our bin liner covered benches could be the difference between surviving or being discovered and detained. Dorey’s set design truly astonishes; entering the space the audience are greeted by a steel cargo crate exterior that immediately intrigues yet fills the space with fear. There is a sense of an unknown future, and for a set to do that alone is powerful. Our security blankets of lighting are taken away as the first 5 mins of the piece are performed in the dark. A very clever move as it’s not to be forgotten that the action takes place on a cargo crate where there is no light. The audience are immersed into this horrific experience and have to solely depend on the voices and questions asked by the cast. This is uncomfortable as we take for granted the thought of judging someone on first impressions by look and not by sound, and elaborates on the fear garnered by the staging. Berry-Hart writes a complex piece of theatre attempting to tackle an array of themes from migration to identity, politics to relationships, however the script is structurally untidy. I admire Berry-Hart’s fusion of genre, merging a dystopian thriller with the socio-political ills currently facing the West from Brexit to a possible USA governed by Donald Trump however many of her ideas become lost as she is tackling a vast amount of ideas. David Mercatali directs an ambitious piece of theatre, challenging perceptions of migration by the choice of accents used. Migration doesn’t remain a distant term but immediate. Hearing accents similar to the audience watching the show makes the evening unquestionably immersive. Staged in the round, there is nowhere for the cast to hide, creating a fish bowl effect that allows for the audience to draw their own conclusions about the characters and the narrative. Writer and performer Charlotte Josephine speaks about her latest piece, BLUSH!